B.C. Lions quarterback Travis Lulay runs with the ball during a game against the Calgary Stampeders, in Calgary, on Oct. 13, 2018. Tears welled in Travis Lulay’s eyes Thursday as he spoke about ending his CFL career. Lulay spent all 10 years of his CFL career in Vancouver and lead the Lions to a Grey Cup in 2011, the same season he was named the league’s most outstanding player. “The mental and emotional energy I put in to coming back, it just takes a toll,” he said. But the decision wasn’t easy. Spending a decade with a single CFL franchise wasn’t something Lulay ever set out to do. The native of Aumsville, Ore., said he only brought a small suitcase with him to training camp in 2009 because he didn’t know if he’d be driving home again in two weeks. “He’s left an indelible footprint on the league and I expect we’re going to see great things from Travis in the days ahead,” CFL commissioner Randy Ambrosie told reporters at the Lions’ training facility in Surrey, B.C., on Thursday. 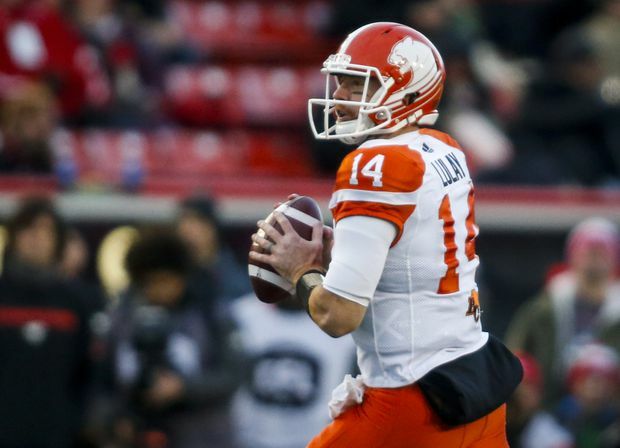 Earlier this month, the Lions signed Lulay’s good friend Mike Reilly to a four-year, $2.9-million contract. The pair met nearly a decade ago when Reilly was Lulay’s backup in B.C. and for months the friends have been talking frequently about their futures. Knowing his friend was taking the helm made Lulay’s decision to retire a bit easier. “To have a guy like him that I could call and lean on for support, advice, all those kind of things, it made my job much easier,” Reilly said. One of Reilly’s favourite memories of Lulay is being barefoot and in board shorts in Hawaii, tossing a football around on the morning of Reilly’s wedding. For Lulay, relationships like the one he’s grown with Reilly are the best part of his CFL career. While hoisting the Grey Cup in Vancouver stands out as the best moment on the field, it’s the people that he’ll have going forward. “I’ve got some really close friends who mean more to me than the wins and losses,” he said. As for what’s next, Lulay said he isn’t sure yet and will take as much time as he needs to decide. He’s still interested in football, whether that means broadcasting or coaching or something else entirely.